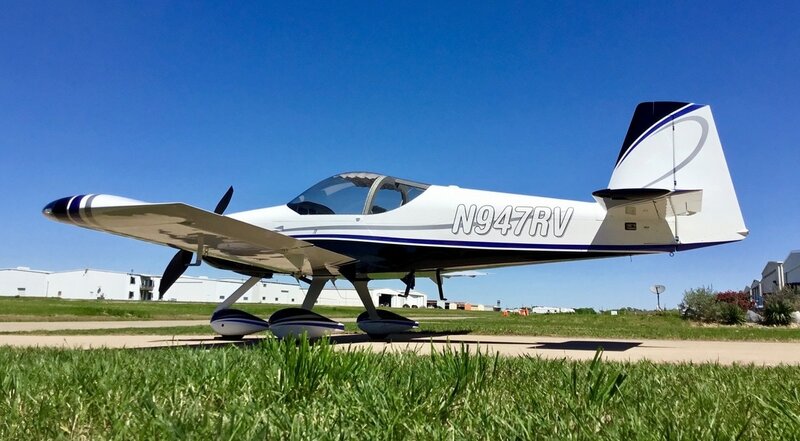 This is latest update about our RV-14A build. We have a finished the airplane and I can say that Romeo Victor is a pure joy to fly. I did some loops and rolls the other day to get a feel for her acrobatically and I can say she is a smooth airplane, totally suitable for gentleman's aerobatics if your are trained. Even with the big prop she picks up speed quickly, especially on the downside of loops. Be careful, get training, watch the "G's" and stay under the acro weight limit published by Van's. THIS IS IMPORTANT!! We also had the static system certified for IFR flight by EXP Services at 52F. Walt also balanced our prop, it was way out of balance and he wrote an article on VAF about it. Every prop needs to be balanced. I thought our plane was smooth, but the difference after balancing was amazing. BALANCE YOUR PROPELLER. It will save wear on your airframe and engine. GloCustom, did the paint and they were great on all counts. They have painted 300 or more RV's and they know their craft well. They are professional and I do recommend that you put them on your list as you look for a quality painter. I flew 1000 miles to have them paint our plane, and believe experience really counts in the case of getting a light, quality paint job. There are more pictures of the completed plane on the picture page at the end of the the site. First flight was on December 15, 2016. After a one hour flight we determined what needed some work and what went well. We now have 25 hours on the plane as of January 23 and we have worked out most of the kinks, nothing major, more annoyances with electronics and trimming. By the time we get to 40 hours, I'm sure N947RV will be ready to go to the painter. For pictures, go to the FAA Inspection & First flight section. The plane is absolutely wonderful, with outstanding performance. The Hartzell CF propeller has turned out to be very smooth and quite a performer. The Lycoming IO 390 is a fire breathing, deep lunged powerhouse and any one doing a build with this combo will not be disappointed. After painting and 50-100 hours of flying, we will do a final section on this site. We will try to wrap up the the 3 years of building and also take some final pictures of the painted plane and add our closing thoughts. The painter needs 4 to 5 weeks to do his magic. There will not be any new material until then, so please don't send notes asking what happened, I just won't have any meaningful content to add until that time. So, cheers and good luck with your RV, and if you haven't started your project yet, what are you waiting for. Welcome to our RV 14A Construction Site. Carl and Rafael are previous RV airplane builders. We are known as repeat offenders in RV jargon, who enjoy building and flying Vans RV airplanes. You can see our previous builds in the next 3 sections. Yes, we may be crazy, but we are convinced building RV's keeps us happy, thus helping us live longer. The reason for this web site is to keep friends and family informed about our project and to share our progress and our building experiences with other builders. Sharing can lead to improved quality and knowledge if it is done in the spirit of improving the breed. Homebuilders are a super resource and great people in general. In addition, the FAA requires documentation by the builders as part of the process of showing quality, airworthiness and licensing. This site will fulfill the some of those requirements. This site will be populated as we build the airplane and will be organized from the empennage down since this is where you start on Vans Kits. We will add the pages and sub-pages as we build over time. We expect the build time to be about 2-3 years depending on Vans Aircraft delivery schedules and the lead times of some of the subsystems such as the panel, engine and propeller. So, if we can help you with your dream to build and fly an RV feel free to drop us a line via the contact section on the last page of the site. So why are we building this when we already have 2 exceptional RV's now?